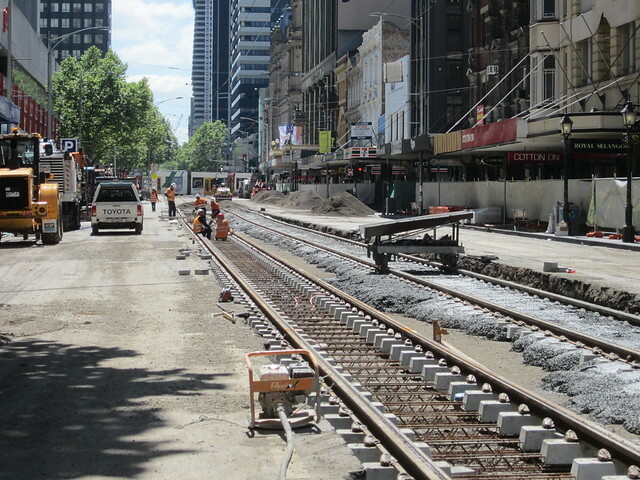 Traders might be complaining about it, but there was no shortage of people around yesterday at lunchtime, and while noise and roadworks may be an inconvenience, it’s not as if the local shops don’t benefit from their location next to one of Melbourne’s busiest tram streets. 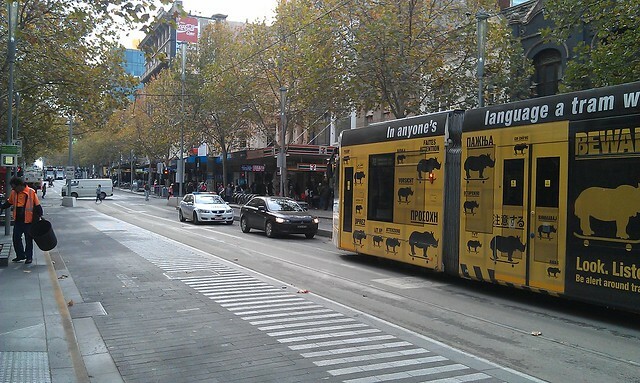 As I looked around the western end of the Bourke Street Mall, I noted this car coming along. 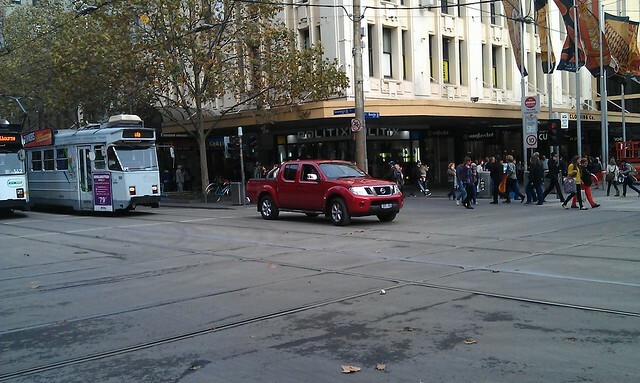 Between two trams, it stopped in the tram stop, unable to go back because of trams behind it, unable to go forward because the road was closed up ahead. 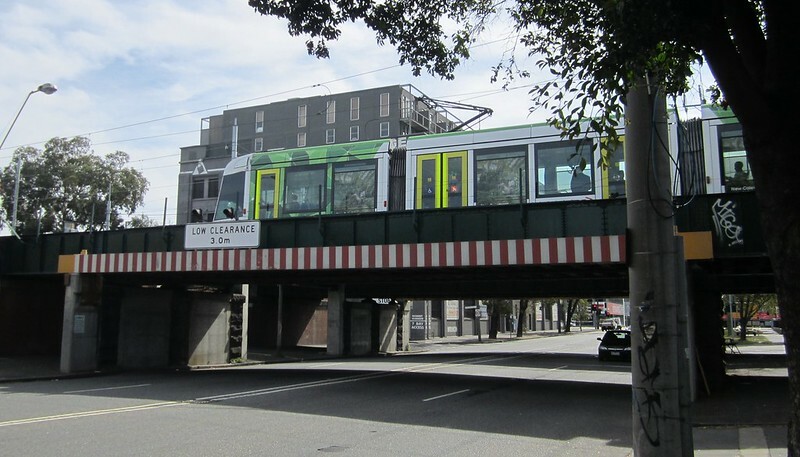 To the amusement of bystanders, it was directed by Yarra Trams staff to do a clumsy three-point turn, nearly colliding with several pedestrians and the tram behind it. 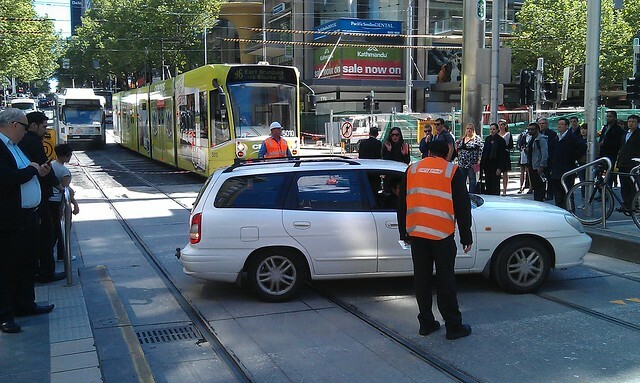 Only a minute or two later, another car came into the tram stop. 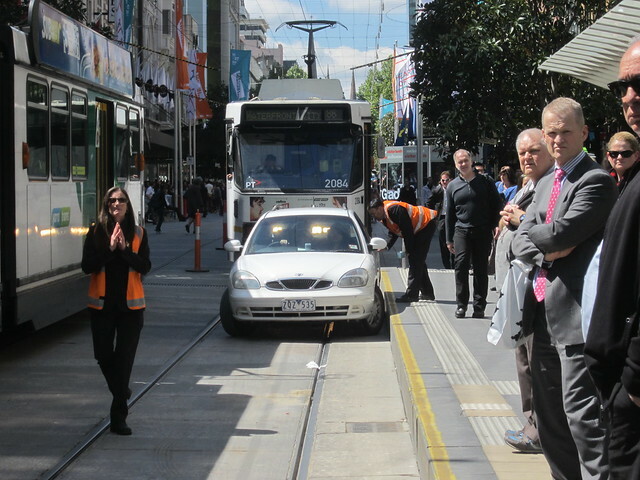 This one being a four-wheel drive, the staff present decided to let it go ahead over the unmade road surface to escape. Ignoring the signs. All the many signs. Where do these clowns come from? There was no evidence they’d been involved in delivering to shops in the Mall. 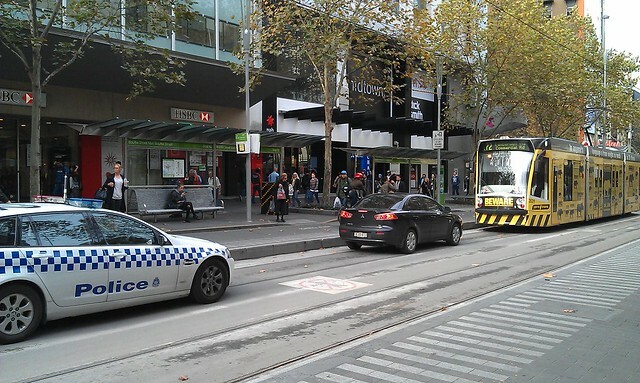 Yet another set of signs add that you shouldn’t drive through the tram stop at the western end. 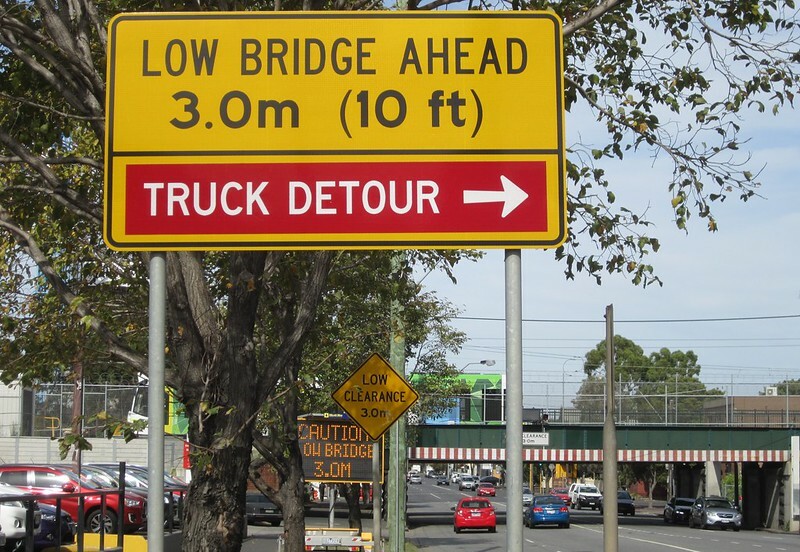 So it’s not just a case of “I didn’t see the signs”, it’s a case of not seeing (or ignoring) three or four separate sets of signs. 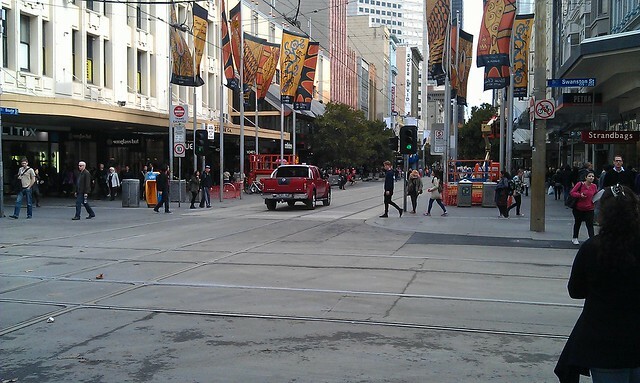 The Central section of Bourke Street has been a pedestrian mall since 1983. 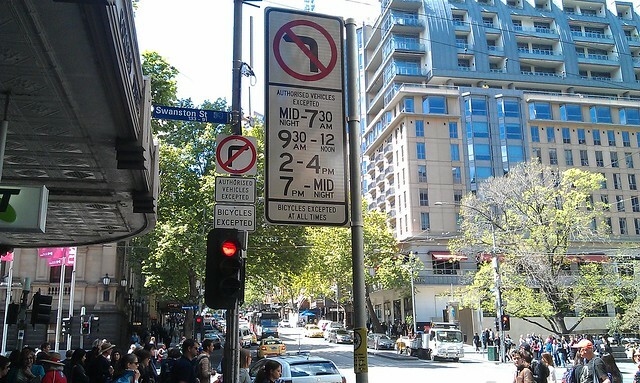 For that matter, Swanston Street has been restricted to traffic in daylight hours since 1992. 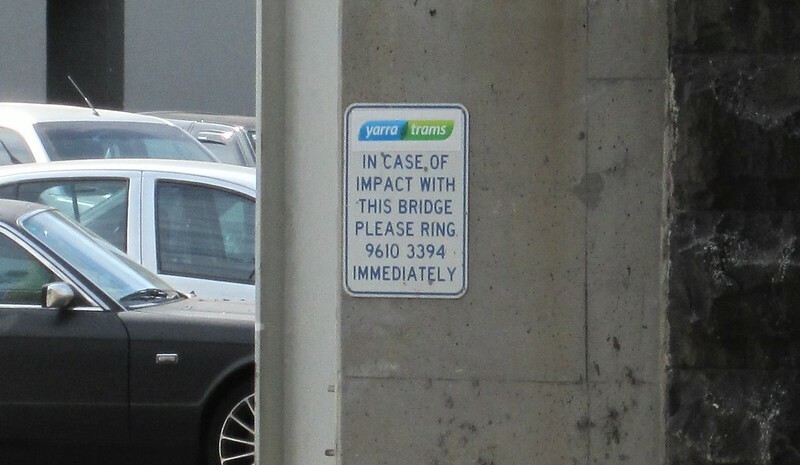 I’d have thought at least drivers from the Melbourne area should have got an inkling of the restrictions in these areas by now. 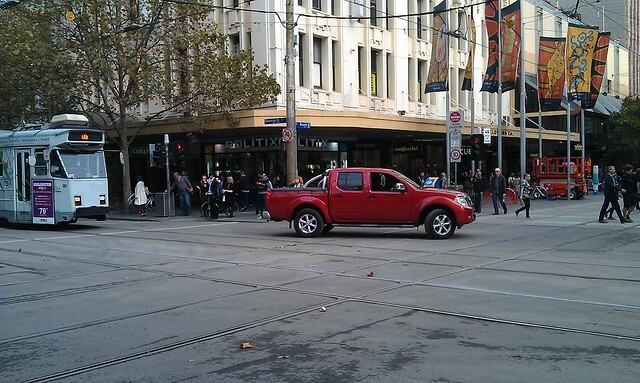 …in fact, Marcus Wong snapped some motorists in the Mall around 4pm yesterday getting a ticking-off from police. Update 1:30pm: What the heck, more pictures added. 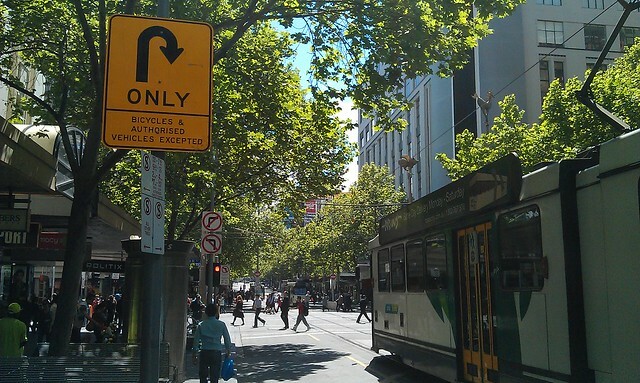 Motorists in pedestrian areas – is there something about No Entry they don’t understand? 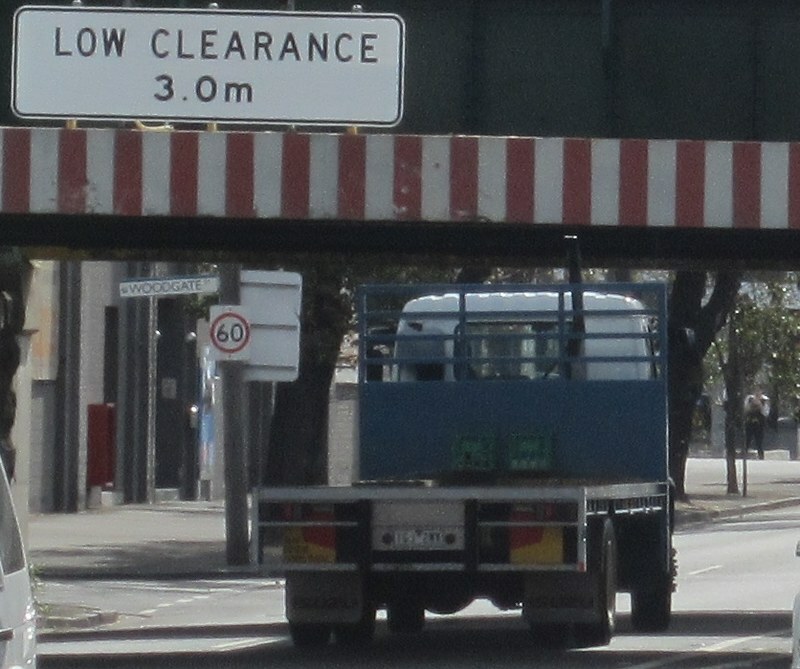 Some of those of us who hang around the city are truly amazed at the number of motorists who ignore the “No Entry” and turn ban signs and drive along streets they’re not meant to. 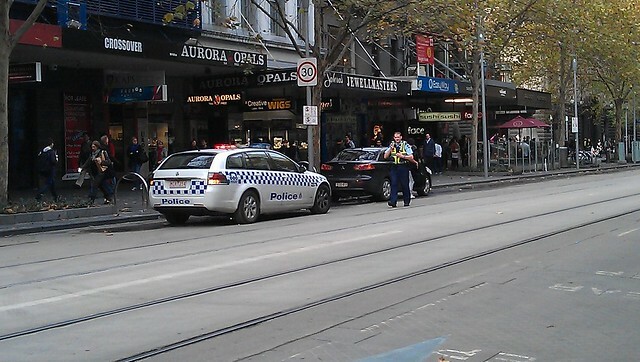 So it’s nice to know that — just occasionally — they do get pulled over by the police. Unfortunately others seem to get away with it scot free — and it’s unclear to me why police seem to be less keen to catch people driving through pedestrianised areas than they are to book jaywalkers. 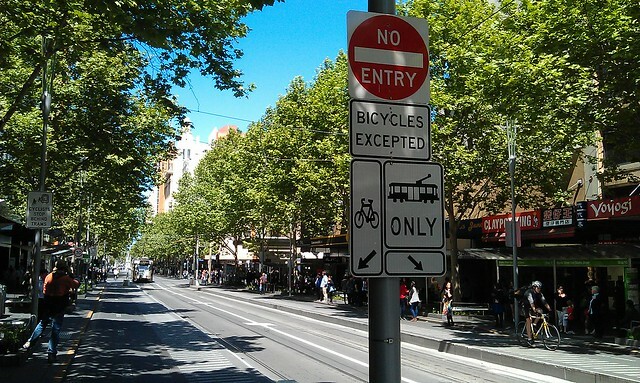 This bloke not only ignored the No Entry signs when turning into the street, he went past multiple signs telling him to do a U-turn before this intersection, then when rightly faced with more No Entry signs, initially looked confused, then took the most-pedestrianised street (the one that even bans bicycles), the Bourke Street Mall. 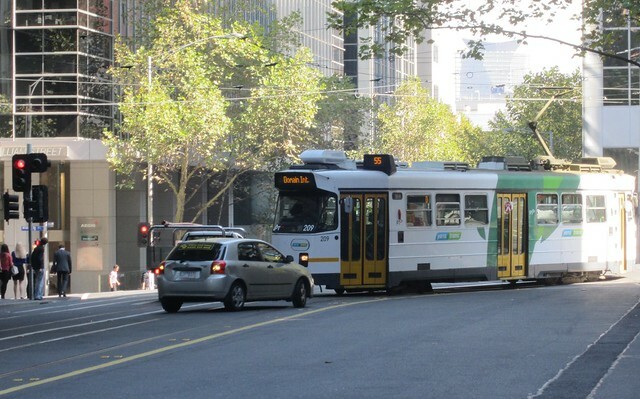 …this person, who ignored the convention to keep left of the white line in Flinders Lane, and came up against this tram coming around the corner. 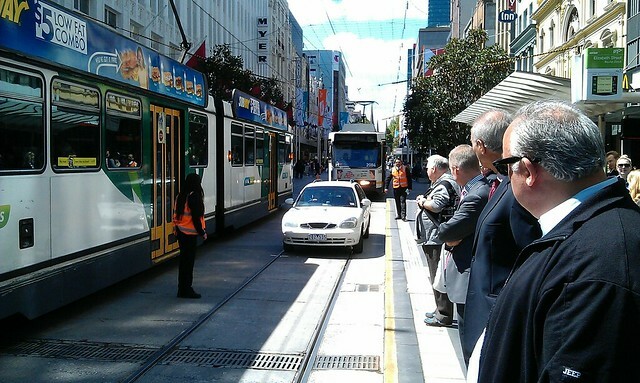 The tram actually had a fair pace making the turn — luckily it stopped in time to prevent a collision. 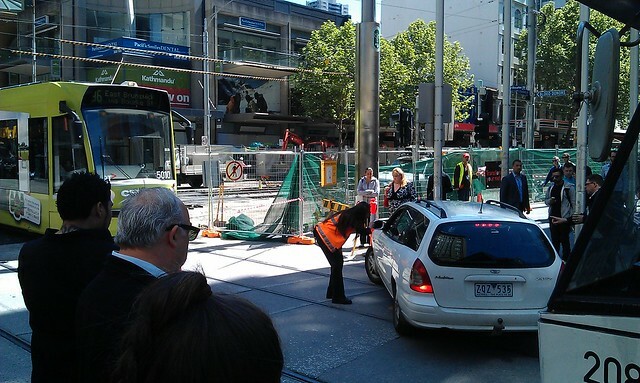 The motorist backed out of the lane, and hopefully learnt a lesson. In an ABS survey in 2009, 4.0 million people (18.5% of the population) reported having a disability. Of people with a disability, Mobility aids used by about 15% of them. So about 600,000 people nationwide use mobility aids of some kind: walking sticks, walking frames, wheelchairs. Additionally, the 2011 Census says there are 1,457,571 people aged under 5. Let’s assume that all of these kids either ride in a pram pushed by a parent, or walk under close supervision with a parent, eg another 1,457,571. And let’s ignore for a moment that some of the 600,000 people who use mobility aids are aged under 5, or supervising those under 5. 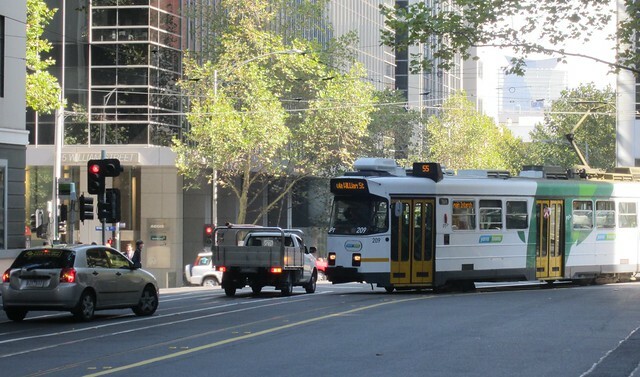 What we get is that perhaps around three and a half million people (about 1 in 6) in Australia have some challenges with simply walking down the street. They need two things to help get around their neighbourhood. 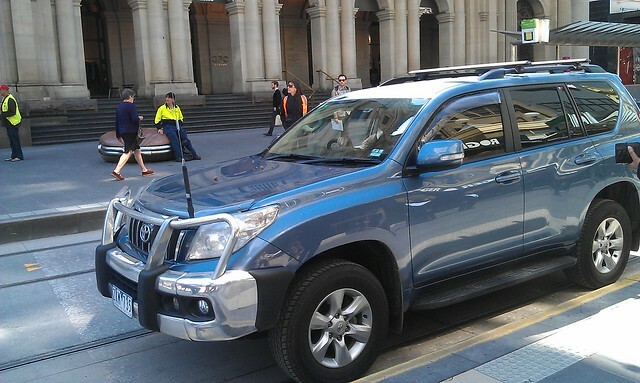 Firstly they need adequate footpaths provided by councils and road authorities. 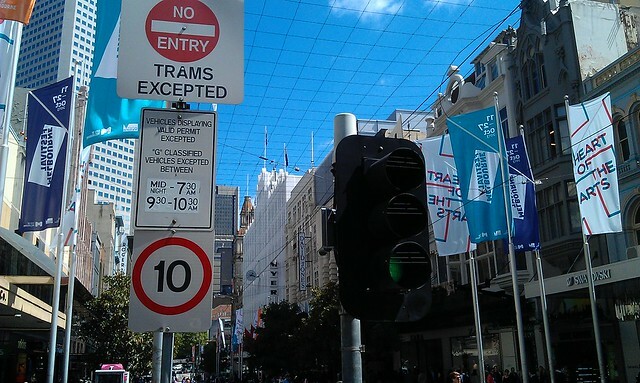 This means both sides of the street, built with proper drainage, and designed for minimising journey distances, rather than taking long detours to get places. Adequate road crossing places also need to be provided — responsive traffic lights, pedestrian refuges (islands) and so on. 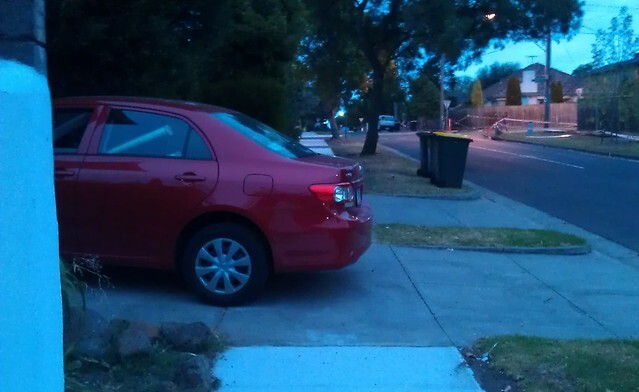 And secondly, they need people to not block the footpaths with their motor vehicles. To do so is the ultimate in arrogance and thoughtlessness for three and a half million of your fellow citizens. Yet I see it continually when walking. It’s high time there was a crackdown on it. Personally, in the last few months I’ve left several polite but firm notes around my neighbourhood on repeat offending vehicles — they seem to work, and it’s probably easier than trying to convince the council or police to do something about it (though pleasingly, it does sometimes happen).